I am mad at myself. 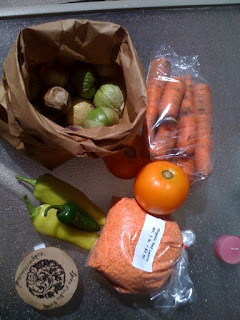 I live within walking distance to a perfectly good farmer's market, the Ferguson farmers market to be specific, yet I have only made it over there twice this summer. This last time, I seemed to shop according to colors. I was particularly attracted to orange stuff, it seemed, this time. Red lentils, orange tomatoes and carrots. This called for an all-orange dish! And since curry powder is orange-ish, what better than to make an orange curry? My mom's favorite color is orange. Except she calls it "Oinge." It's not a speech impediment, it's a regional accent. A very hard to explain regional accent, but those from St. Louis or close will (maybe?) understand. It's the same regional accent that brings us "farty far" (highway 44) and "warshington." So, even though she would not try this dish, I will refer to my Orange Curry as "OINGE Curry" for my mama-san. Heat oil in a non-stick wok or skillet. Add minced garlic, shallots and ginger. Cook for about 30 seconds, then add curry, ginger powder, crushed red pepper and a pinch of salt. Cook until transluscent and starting to brown. Add Carrots and banana pepper, cook until carrot starts to soften, adding orange juice as necessary. Add tomatoes and bell pepper, cook until the flavors are meshed but the bell pepper is still slightly crunchy. Serve over cous cous and red lentils. Meet my good friend Eric. He is a musician, poet, bowler, social media guru, mexican food lover and all around cool dude. That's why when he asked me to go to Nashville with him to see one of his favorite bands, The Damnwells (and you should really click this link and check them out... they're latest album is a FREE download, and it is awesome! ), play live, I was totally game. I love me a good road trip! Did I mention he has a convertible? 'Cause he does. Which helped when he added Birmingham to the road trip, to see the Damnwells 2 nights in a row! And while we're at it, let's hit Memphis on the way back to St. Louis! See? EPIC. First Step, Nashville Tennessee. Eric was hoping to hit places that his favorite food network show, Diners Drive-Ins and Dives has been to, but they didn't seem to have been to Nashville yet. I did some research, however, and found this clip from a Bobby Flay show. Hot Chickens! Apparently a Nashville thing, consisting of fried chicken covered with scorching hot sauce, served on bread with pickles on top. The show highlights two places, Hot Chickens.com (which oddly is not an actual URL for the restaurant) and Prince's Hot Chicken. 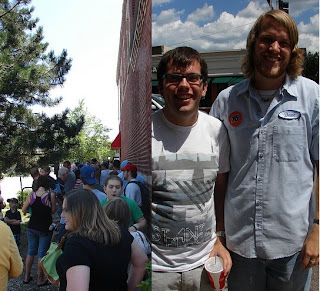 We tried to find Hot Chickens.com first, because they had a wall of fame, and I knew Eric could take the heat and get himself on it. We couldn't find it, though! It's either been replaced by a Mexican place or we had the wrong address. So we went to Princes. When we arrived there it was about 5 minutes from opening, and there was already a line outside waiting to get in. Good sign! The place is not the best-looking joint... in a run-down strip-mall, the decor consisting of a hodge-podge of cheaply framed chicken artwork hung haphazardly on the bright teal walls, and styrofoam plates signed by who-knows what celebrities stapled to the wall above the ordering/pick-up window. I grabbed an uncomfortable booth while Eric went to order. and he got the Xtra hot breast. It was slow-going for me, as the spicy sauce combined with the warmth of the room and made it almost dizzying. Eric took down the extra hot like a champ, even though there was no wall of fame.... he did it... just to be macho? :) The boy is addicted to heat, for real. Later when walking downtown we saw this ad that said exactly what Eric had been saying all day after Prince's Hot Chicken. Ha! So, It was good fried chicken... I would recommend milder than the medium-hot, though, for maximum chicken enjoyment.... although getting sweaty while eating is fun, too. For dinner in Nashville, our friend Woody insisted that we hit up Swett's. Woody is an eater and a drummer who has traveled, so we trust his advice and go to this soul-food cafeteria. A place with lots of seating, where you grab a tray and go through a line where a woman who calls everyone "honey" serves you up your choice of southern favorites...mmmm... greens. Good call, Woody! That night the Damnwells put on a damn fine show in a small basement venue (called the Basement, of course). The next morning we hit the road for Birmingham, Alabama. About 45 minutes on the road, we prepared to stop for gas, and noticed signs directing us to none other than the Jack Daniels Distillery. It was about a half-hour detour, and completely unplanned, but we could not resist! Worth it! Our tour guide was so southern and so awesome. The distillery is on very pictureque grounds, rustic yet clean... streams, woods, old old buildings. And oh the smell. Even the super-strong vapors from the mash had us craving a sip of whiskey. Unfortunately, the distillery is in a Dry County... as in they are not allowed to serve alchol. Crazy! We did find an ice cream place in the quaint, though tourist-trappy historic ynchberg that had Jack-Daniels and raisin ice cream and Jack Daniels whiskey sauce... something I will be recreating because... yummmm. I will never stop laughing about this. And whiskey-less we headed to Birmingham! For dinner in B-ham we took Rachel's advice and hit the Fish Market downtown. The Fish Market is an interesting place... Part gourmet grocery store, part fish market, part restaurant. The restaurant part took a sec to figure out... there are no waiters... you order and sit down and wait for your pager to go off to pick up your food. 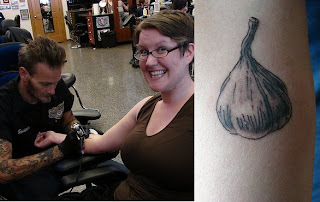 However, there are busser-type people who will take your pager from you and bring your food to the table for you. And the food? We were expecting Greek, but it was more of a mix of Greek and traditional southern. My greek Scallop soup came with hush puppies! All in all a fun place! The next morning we visited the Birmingham Civil Rights museum, (recommended!!) then hit the highways again for Memphis. Finally, we would get to go to a Diners, Drive-Ins and Dives Destination. Uncle Lou's! Another run-down strip mall place with big eats. I got some fried chicken in the 3 different flavors, the most famous being Uncle Lou's Sweet and Spicy Love sauce. Eric got a hot fried Balogna sandwich with was quite intimidating! Sweet corn fritters rounded out the meal. Everything tasted great, and we even got to meet Uncle Lou! Oh, Uncle Lou is all about being famous. He was LOVING it! This was our only Damnwells-free night of the trip, so we basically hung out on Beale Street all day. Over-priced too-sweet drinks, but GREAT people watching! Some good music, too! For dinner we couldn't resist a trip to Neely's BBQ. Yup, another Food Network favorite. We ordered a sampler meal for two that had the smoked turkey, ribs, and brisket... a huge plate of meat basically. The best part of the meal was the peach cobbler.... soooo buttery. I'm not a huge cobbler fan... rather I wasn't until I had this one. Before Leaving Memphis and concluding our Epic Road Trip, we were DETERMINED to find a good breakfast place. When we asked the front desk at our hotel in Birmingham for a good local place, were told IHOP or Waffle House!! Outrageous! Luckily in Memphis we found Bob's, and got a proper Southern breakfast finally to the trip! ya'll come back now y'hear? 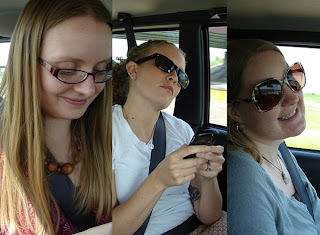 St. Louis Bloggers are Taking Over! Alanna, Nupur, Becky and Stef were featured in the St. Louis Post Dispatch. And Stef also will be writing about cupcakes for Paula Deen's website!! My Hot Doug's buddy, Kelly, had a feature article published in the STL's foodie paper, Sauce Magazine. Kelly was in the Post Dispatch also, because of her trip to LA to see the premier of Julie & Julia, which she wrote about on Steamy Kitchen. She was also mentioned in this Philadelphia Inquirer article about the movie, and got a comment from Julie Powell herself on this post about the Film! She was also asked to appear on KMOV channel 4's morning show "Great Day St. Louis," but she had to decline because she was out-of-of town. So who went in her place? Yours Truly! Check me out! I was so nervous until the interview got going. I had never been on TV before. Phew! Speaking of Chicago roommates who are writing for local papers, Kelli will be writing a food column weekly for the Riverfront Times' website! I can't wait to read it! I am a tease. 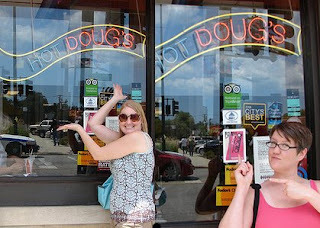 Mentioning Hot Doug's in my Chicago post, but making you wait until now to read all about it. 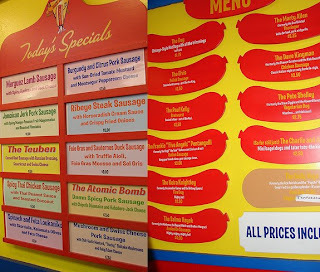 I'm sorry, but as you will see, The Encased Meats Emporium and Sausage Superstore really needs it's very own post. And this is it. Hold on to your buns! Once inside, there is plenty to look at... the place is decorated in primary colors, with tons of hot dog memorabilia, including Oscar Meyer Weinermobile stuff, which cracked us up because we were *this* close to hitching a ride to Hot Doug's in the Weinermobile that was hanging out at BlogHer. There was also this, which I NEED in my plate collection, so if you know where to get one....gimme! Then there are the menus... they have a regular menu and a daily specials menu. 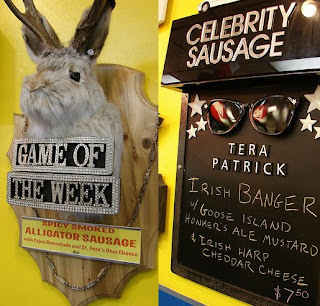 They also have a game of the week dog and a celebrity dog! And who was there to take our order but Doug himself! He's a good sport. We are nerds. Kelly and I ordered 3 dogs from the "Today's Special's" Menu to share. We tried to cover 3 different kinds of meat, poultry, beef and pork. Of course we got the foie gras dog! 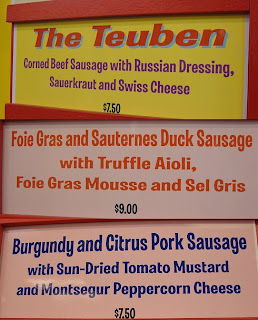 The other 2 we got were the brilliantly named "Teuben" and a pork sausage. And OF COURSE the fries. They are fried in Duck Fat!!! Gorgeous! I think Kelly would agree that the Teuben was our favorite surprise. Yeah, because of the name, but also because it was really darn tasty! And the Ginger Beer went really well with it! Oh, didn't I mention we did soda pairings with each of our dogs? 'Cause we sure did. Again...nerds. The Foie Dog. What can I say. It may be the most rich and luxurious thing I've ever put in my mouth. It was indeed my first Foie Gras experience, and I can see why people are so passionate about it. As if that wasn't fancy and delicious enough... truffle aioli!! There are no words. The Sel Gris was a fantastic touch, adding just a little bit of crunchy texture to some of the bites, and bringing out the other flavors. An epic hot dog if I've ever seen one. 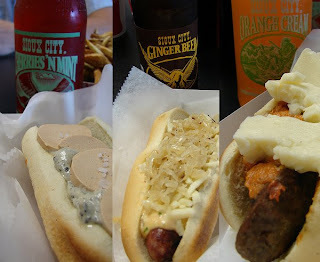 If you are not familiar with the story, Hot Doug's continued having these on the menu during the Chicago Foie Gras Ban. Rebels! The ban has since been lifted, which is a shame because I like breaking the rules. It required a long line and a scary cab ride, but Hot Doug's is worth it! A fun and satisfying destination, tube-be sure! My car/roommates... Kelly drove and provided popcorn with truffle salt (referred to as "Crack Corn" due to it's addictive deliciousness) and breakfast. Kelli also made snacks... awesome cheese straws that tasted like Cheezits but WAY better. She used this recipe, I believe. After Spider Legs (that was the artist who did Kelly and my tatts) worked his magic on our skin, we had a couple drinks at the bar next door, then back to the hotel, where we finally had a room, to get gussied up for dinner. Why gussied up, you ask? We were going to Blackbird!! Rather than doing the planned tasting menu, we opted to order several apps and entrées and share. Among my favorites were the veal sweetbreads with golden beets, molasses, pine aioli and summer truffles, some amazing roasted quail, California sturgeon with peas, braised peanuts (a revelation for me! 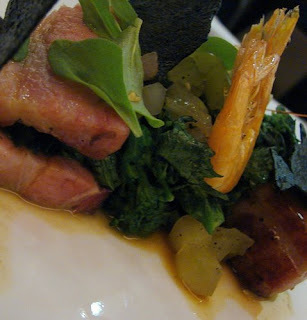 ), bacon and bourbon caramel, and pork belly with sweet crispy shrimp, chinese broccoli, preserved green tomato and black pepper (pictured below). A fantastic meal. Recommended! The next day, I roamed around Chicago by myself... checked out some museums and sights, got a chicago dog at some random corner bar... basically got lost and explored. The Chicago Art Institute has a really neat exibit about wine right now. If you are at all into wine you should try to check it out! In the evening, there was a food blogger dinner at a Greek restaurant. It was so exciting to attend this and meet my foodie kinfolk. There were about 30 of us (all listed here, thanks to Alanna!) We ate, we took photos, we talked food. Pictured below are Kelly and Jaden, Elise and Lydia, and Gudrun and Kathy. You can read more about this gathering on Kelly's, Jaden's and Gudrun's blog! That evening, while the other gals attended swanky BlogHer cocktail parties and such, I walked to Frontera Grill, grabbed a seat at the bar and had some tongue tacos, made famous by Rick Bayless on Top Chef: Masters. Sooooo good. I got some to go for the others, though Frontera people were a little reluctant to do food to go because they weren't sure how they would taste once cold... I guess it's good that they care about the integrity of their food. They tasted great after being walked a few blocks, by the way. All in all a fabulous trip. Thankyou BlogHer for the opportunity to travel to Chicago and meet fellow bloggers. I do not at all want to down the event itself. I would totally go to BlogHer food in a heartbeat... I just felt that Chicago itself had more to offer me than this particular conference. I love love love Chicago, and had such a great time with my roomies! If they invite me to New York next year I am in there like swim wear.